Thanks to your feedback, Swimia has grow to be in just a few months one probably the most important web sites of swimming pools. 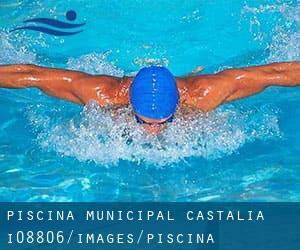 Here you have all the info we know about Piscina-Municipal Castalia, in Castellón de la Plana. Don't forget you can also promote this pool so Piscina-Municipal Castalia will appear the first of Castellón de la Plana, or even the very first of your country, make contact with us to know far more. Swimmers like you reported 25 meters, 7 lanes, 1 meters - 2.1 meters depth, 1 meters - 2.1 meters depth, Non-Chlorine Sanitized, Indoors. Unfortunately we do not have the email address of this Swimming Pool, but we can give you the phone number. Updated on 2019 PISCINA MUNICIPAL DE 50M C/RÍO JUCAR S/N , CASTELLÓN. This sports center delivers waterpolocs.bmp. Contact knowledge for this Swimming Pool such as phone number and e-mail address are number. Carretera Ribesalbes s/n , Castellon de la Plana , Spain (Postal Code: 12006). Few days ago a regular user of this center told us they offer Olympic size x 25 meters, 9 lanes, 2 meters depth, 2 meters depth, Indoors. Furthermore, they keep in good conditions 25 meters x 6 meters, 1.5 meters depth, 1.5 meters depth. For this Swimming Pool, only phone number is number here. Updated on 2019 Cº CAMINAS 175 (COLEGIO LLEDO) , Castellón. Swimmers like you reported Colegio_lledo.png. Phone number and email address are number for this Swimming Pool. Passeig de Sebastián Elcano , El Grao de Castelló , Castellon de la Plana , Spain (Postal Code: 12100). Among all the activities offered by the center, if you are interested in swimming you'll delight in 25 meters x 12.5 meters, 6 lanes, 1.2 meters - 1.8 meters depth, 1.2 meters - 1.8 meters depth, Indoors. Just in case you desire to contact this Swimming Pool before dropping by, we only know the phone number. Updated on 2019 C/ PROLONGACION DEL RIO JUCAR S/N. 12006, Castellón. This sports center offers sincrocs.bmp. Contact information for this Swimming Pool for example phone number and email address are number. Carretera Ribesalbes s/n , Castellon de la Plana , Spain (Postal Code: 12006). This great and large sports center lets professional swimmers like you enjoy Olympic size x 25 meters, 2 meters depth, 2 meters depth, Indoors. Additionally, within these facilities you can try 25 meters x 6 meters, 1.5 meters depth, 1.5 meters depth, Indoors. Unfortunately we do not have the email address of this Swimming Pool, but we can provide you with the phone number.